The Last Guardian's creative supervisor advises fans to "keep an eye out. The Last Guardian has been in development since approximately 2007, and a six-year development time is not always good for games. It's been a long time since any news surfaced about Team Ico's latest project, but fans may not have to wait too much longer. Creative supervisor Fumito Ueda took to his website recently to assure fans that while he had no control over releasing information about the game, Sony should have a statement about it ready in the near future. 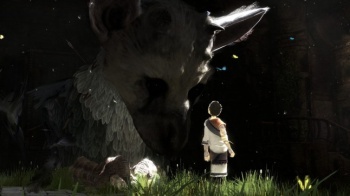 Although Ueda left Sony a while back, he continues to work on The Last Guardian in a freelance capacity, and maintains some creative control over the project. "[The game] is still in development by an incredibly talented team," he insists. Ueda adds that Sony, not he, decides when to release more information about the game. "I should also mention that details regarding The Last Guardian's release is (sic) solely decided by Sony Computer Entertainment, not myself. Please keep an eye out for their official announcement." Given that Sony is sitting on some big news for February 20, an update about The Last Guardian's progress is not off the table. However, don't be too shocked if nothing materializes; as you know, the game is no stranger to delays.